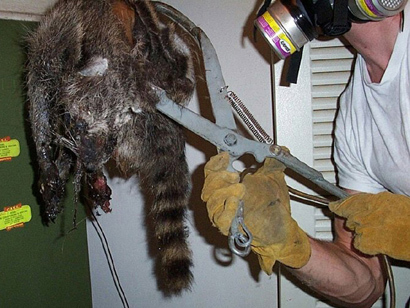 Dead Animal Removal - Information about the humane trapping and removal of dead animals. That terrible odor in your home - it could be a dead animal. 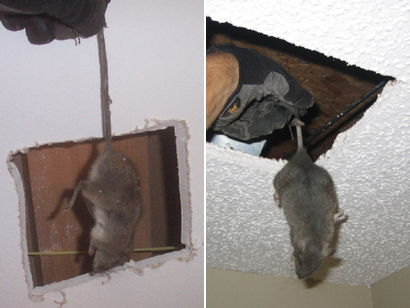 Even a small animal like a mouse can cause a bad odor, if it is in a wall or against the ceiling drywall. A larger animal like a rat can cause a very bad odor for two weeks or more, and a big animal such as a raccoon in the attic or an opossum under the house can cause a tremendous stench that can last for months. It's a fact of life - all animals die, and if you have (or had) animals living in your house, they will often die there. We do dead animal carcass extractions every day, and are experts at locating the animal. We can also find out how it got inside your house, and seal the entry hole(s) shut so it doesn't happen again. Dead rat/mouse in ceiling or wall - This is because rats and muce are common in houses, the live and breed in high numbers, and they commonly get poisoned, and die in the house. Dead opossum in yard - Opossums are large animals, but they don't live very long. They often die somwhere on the property, and the scent can't be ignored. Dead opossum in a building - Opossums like to live in attics, walls, or under sheds or houses. When they die in a house, watch out! The odor is overpowering. Dead squirrel in ceiling or wall - Squirrels are common in houses. Dead raccoon in attic or wall - Sometimes a baby raccoon will fall down a wall too. Dead skunk under house, deck, shed, porch, etc - Account for an extra smell than usual, thanks the the scent gland fluid. HOW DO WE DO IT? Some people ask if we have specialized equipment, like infrared detectors or methane gas particle analyzers, etc. The truth is that experience is the most important tool. We inspect the house, and discover what species of animal lives/lived there - that's an important clue about where it will most likely be. We analyze the building architecture, and use of understanding of where animals had access to, and where they commonly die. Then it's simply a matter of narrowing down the exact location by literally sniffing around until the exact spot is pinpointed. If the animal is reachable, we remove it, triple bag it, and wipe down and decontaminate (with enzyme-based cleaner). Once the animal is gone, and the area cleaned, it's a simple matter of airing out the stinky air in the house, and the odor problem is solved. Finally, we address the original critter entry problem that caused this to happen! First we see if we can use a grappling or snaring tool, and reach into the wall or ceiling cavity to extract the carcass. But most of the time, we have to cut a hole in the wall or ceiling. We start with a test hole next to the point of strongest odor, and confirm the presence of the body. Next, we cut an opening, large enough to get a hand/tool in, and the animal out. We remove the animal, triple bag it, and clean the area with our enzyme cleaner. We then repair the wall, using the original drywall cutout and a drywall patching kit. The removal of a dead animal from inside a wall is very challenging. However, with experience, our technicians have become very good at it. The key is to analyze the room, know where the stud beams are, and actually to stick your nose right on the drywall as you sniff. The whole room may stink to high heavens, but when you get right on top of the animal, the odor changes, not just in strength, but composition. It smells especially putrid. That's how we know where to cut. I will describe some additional dead animal information below, but just give us a call any time, and we can describe in detail how we will resolve your specific dead animal problem in your town. If you want to do it yourself, read my How To Get Rid of Dead Animals page. Dead Animal in Your House - Tips on how to get a dead animal out of hour house. Dead Animal in the Walls - What to do if you smell a dead animal in the wall. Dead Animal in the Chimney - Information about removing dead animal in a chimney. Dead Animal in the Attic - Info about what to do if you have a dead animal in the attic. Dead Animal Information: Finding a dead animal on your property or on the ceiling or roof of your home can certainly be a nightmare. The sight is not aesthetically appealing, the smell is obnoxious and other flesh eating birds and animals are also attracted which pose a danger all their own. The death of an animal might be a result of a natural calamity, attack by predator or a natural death. Dead animals can cause a number of problems, aside from the obvious sight and smell of them in your area or your home. If the animal died in an area which is not directly visible, then chances are you would come to know about it only after a few days when the body starts decaying and the intolerable smell begins to permeate the area. This smell also attracts other animals in the area which eat the decayed flesh of others including vultures, coyotes and hyenas just to name a few. These types of animals can pose a threat to your pets, your home and your lawn and gardens. Vultures are also known to spread the pieces of meat that fall off from their beaks when in flight. Dead animals are also a breeding ground for a number of different bacterium, viruses and parasites such as mites, ticks and fleas. The dead bodies may contaminate the water supplies which can result in the spread of gastroenteritis, which causes inflammation in the stomach and small intestine as well as diarrhea and vomiting. If you are in direct contact with the bodies of dead animals, there is a chance that you can contract diseases such as hepatitis B and C, HIV and tuberculosis to name a few. Hepatitis B causes general ill health, nausea, loss of appetite, fever, body aches, vomiting and jaundice. It may result in death in extreme cases. The symptoms of Hepatitis C are similar to that of Hepatitis B but are generally not visible for first three months after the person is infected. HIV results in loss of immunity and is not curable to date. Tuberculosis results in infection in the lungs and symptoms include pain in the chest, loss of appetite, fever, chills and coughing up blood. Also, the decomposition of bodies produces substances like cadaverine and putrescine which are toxic if inhaled in excess. Where to look for dead animals in case of bad odor? In case there is pungent smell in or around your house and you are not able to spot a dead animal, there are a certain places for you to check. The most obvious places to look include the attic, the insides of walls, chimneys, ducts and under the house. 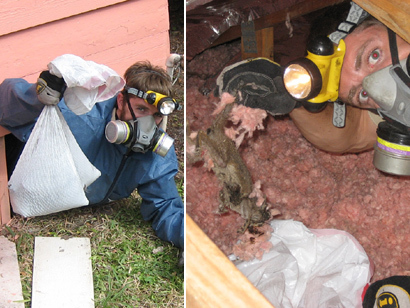 There are animals such as mice and rats that live in the walls or attics of your home. Many times, when they die they are inside your walls or in the attics and are not realized until the foul odors start to take over your home. Other animals such as cats, raccoons and opossums like to live in small spaces under the elevated houses and can become the culprits of foul smelling odors. Removing and disposing of dead animals is nauseating but necessary. Direct contact should be avoided and rubber gloves should be used. Burying the animals is the best possible alternate to avoid the problems and diseases. However, you must check with your local city and county laws before disposing of the bodies to make sure that you are doing so correctly and legally. Also, care should be taken that underground pipe lines and wires are not damaged if you do bury them.